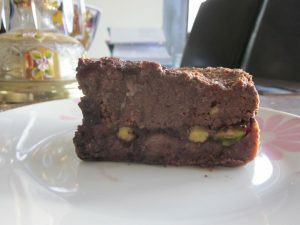 Simple no bake cheesecake with chocolate and dairy, gluten and sugar free. Mix the dates in the food processor then add the rest and make a dough. Line a spring form of 18 centimeters with parchment. Spread the dough in the cake form. Cut the cherries in half and cover the cake base with the cherries and pistachios. Press them gently. Place it in the refrigerator. Scrape the vanilla out of the bean. Melt the chocolate bain marie style. Pour and flatten the mixture on the base and place it in the freezer for at least 4 hours. Bring out of freezer 15-30 minutes before serving. Soaking nuts before use is needed to neutralize the anti-nutrient phytic acid present in them which blocks the absorption of zinc, calcium and iron. Are your genes the only determining factor to your well-being and quality of life?